Puerta del Sol is one of the most emblematic places in Madrid. Because it is the historical center of the city and of the country, since it is indeed the "kilometer 0" of all national roads in Spain, and because it is a place with history, past and present. 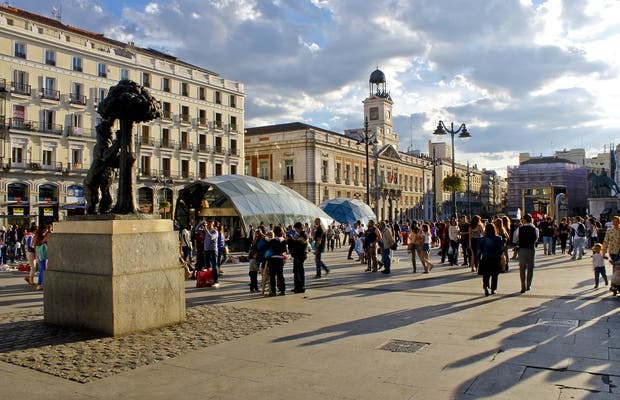 It is one of the common meeting points for young people in Madrid, it is one of the best located places when you have to go shopping in the center and it is also known for the very famous New Year's Eve celebrations. Puerta del Sol is a must-see for all visitors of Madrid, despite the hustle and bustle, I highly recommend it. In the last years, the authorities have tried, with relative success, to clear the area limiting traffic to most vehicles. Puerta del Sol is one of the most emblematic places in Madrid. It is also the Kilometer 0 of the city, from this point all the distances with the other cities in the peninsula are calculated. It is a place always lively, from there Preciados street starts, which is one of the most commercial in the city, but it is also a meeting point for many people before going out to bars and restaurants of the neighborhood. A must for every person visiting Madrid. Specially during the holidays! Take a picture on the actual solar dial that marks the starting point to all roads and highways in Spain. Entertainment all around. Restaurants with small but beautiful terrace. Also the perfect place to start a tour in the most unique place in the city, full of people. Much improved in recent years! Can be a bit crowded but a must see!